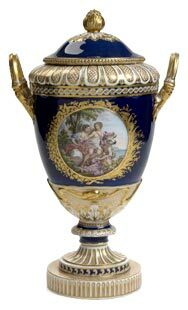 The History of Antique Berlin Porcelain … The Company, Johann Ernst Gotzkowsky, Frederick the Great and Berlin Porcelain Marks. 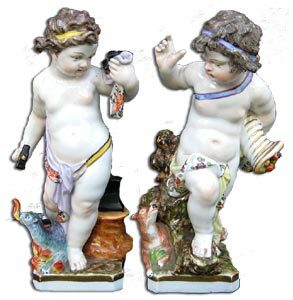 The Berlin porcelain factory was founded in 1761 by Johann Ernst Gotzkowsky, who picked up the pieces of the factory belonging to Wilhelm Casper Wegely, after it went bust in 1757. When Wegely, a wool-manufacturer, obtained a licence to set up a factory with the help of many Meissen and Hochst workers, who probably supplied the necessary kaolin and a model for a kiln able to produce porcelain. Quality however was of a poor standard and Wegely had to close the factory due to financial problems. During its existence, Heinrich Reichard was the master modeller and Isaak Jacob Clauce the painter. Porcelain wares produced by the Wegely factory were marked with the initial W and a combination of numbers. During the following four years the Berlin Porcelain factory failed to produce any porcelain. In 1761 the merchant Johann Ernst Gotzkowsky, bought the arcanum from the Wegely modeller Reichard. He also secured the collaboration of the Wegely painter Clauce and bought the remaining stock of the Wegely factory. In order to improve the quality of the porcelain, Gotzkowsky hired experienced craftsmen from the Meissen factory. These included the modeller Friedrich Elias Meyer and the painters Karl Wilhelm Bohme, Johann Balthasar Borrmann and Karl Jakob Christian Klipfel. 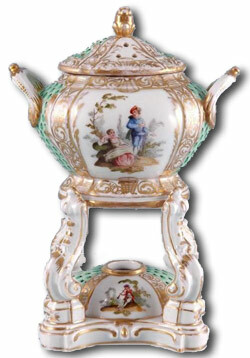 The quality of Antique Berlin Porcelain increased enormously, but so to did the costs of production. After only two years in operation the new factory was employing around 150 people and as the demand for porcelain goods was limited to the very rich, Gotzkowsky was overwhelmed by financial difficulties. Johann Ernst Gotzkowsky was forced to sell the factory to Frederick the Great in 1763. Berlin Porcelain and Frederick the Great. After acquiring the Berlin Porcelain factory, Frederick the Great took great steps to promote it and to maintain the quality of the porcelain and the wares. Frederick II allowed Berlin Porcelain to use his emblem, a cobalt-blue sceptre and from then until the abdication of Emperor William II, Berlin (KPM) was owned by seven different monarchs. During the rococo period Berlin Porcelain became the leading German factory, particularly for porcelain dinner services. The Meyer brothers, originally recruited by Gotzkowsky, modelled outstanding figures and Berlin porcelain flower-painting (called Deutsche Blumen) set the standard for other factories to follow. Every piece of porcelain ever created by Berlin porcelain (KPM) was handmade and throughout its history various outstanding ceramic artists have worked at Berlin porcelain. 19th century artists and designers include Karl Friedrich Schinkel, Christian Daniel Rauch and Johann Gottfried Schadow. 20th century artists and designers include Gerhard Marcks, Trude Petri and Marguerite Friedlaender. Just like many other porcelain factories, the Berlin Porcelain factory has had its ups and downs over the years, but it has always managed to survive the difficult periods. In 2006, Berlin banker Jörg Woltmann purchased and became sole shareholder of Berlin porcelain now known as the Königliche Porzellan-Manufaktur (KPM). Today the Berlin Porcelain factory is still one of the leading porcelain manufacturers in Germany and it still sells high quality products all over Europe and the rest of the world.